Senior Bharatiya Janata Party leader Jaswant Singh, whose book eulogising Mohd Ali Jinnah has come under attack from BJP and the Sangh parivar, was on Wednesday expelled from the BJP. The decision to expel Singh, a Lok Sabha member and a former Union Minister, was taken at the Parliamentary Board of the party which met in Shimla during the opening session of the three-day brainstorming session of the top leaders here. BJP President Rajnath Singh, who had on Tuesday issued a statement totally distancing the party from Jaswant Singh's book "Jinnah - India, Partition, Independence", announced the decision to the media. "I had issued a statement yesterday that the party fully dissociates itself from the contents of the book. Today I put up the matter before the Parliamentary Board which decided to end his primary membership. So he has been expelled. From now onwards he will not be a member of any body of the party or be an office bearer," he said on the expulsion of the 71-year-old party veteran. Rajnath Singh said on Tuesday he had told Jaswant Singh not to come to Shimla for participating in the 'Chintan baithak'. 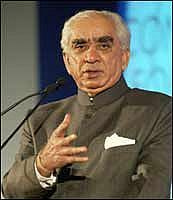 Jaswant Singh, who had held the posts of Finance, Defence and External Affairs under Atal Bihari Vajpayee, was virtually declared a persona non grata when the entire BJP top brass and other leaders kept away from the function on Monday in the capital for the release of his book. That things were not well with Jaswant Singh was clear this morning when he did not stir out of his hotel even after the brainstorming session began in Peterhof, the venue of the session. His aides kept saying that he was not well and was resting. Rajnath Singh took a break from the brainstorming session to come and brief the media on the expulsion decision. The party was averse to Jinnah and even L K Advani had to backtrack on his comments about the founder of Pakistan after a visit to that country in 2005. He was made to step down as BJP President and the party adopted a resolution condemning Jinnah's role in the Partition. In the aftermath of the Lok Sabha debacle, Jaswant Singh had criticised Advani's appointment of Parliamentary office bearers and called for a link between "performance and rewards." He was then considered to be a dissident along with leaders like Yashwant Sinha and Arun Shourie. However, the party sought to delink him from the other dissidents by nominating him the Chairman of the prestigious Public Accounts Committee of Parliament.